It'd be wrong to say that the cast of Sesame Street just discovered the internet. As it is, the show's characters have dozens of games and mobile apps, with a large video archive that goes at least as far back as "Me Lost Me Cookie At The Disco." It would seem, though, that someone over at the Sesame Workshop has been working to bring Big Bird and co. into the twenty-first century. For starters, Big Bird only just issued his first tweet ("tweet" -- get it?) last week. Meanwhile, PBS Kids just premiered Cookie Monster's first movie, The Cookie Thief, and, in an effort to promote it, also came up with this ingenious gif generator that basically lets Cookie take over your browser. You can watch the movie for yourself through the PBS Kids Video app or any popular streaming device (like Apple TV, if that's your flavor). For now, though, in honor of Cookie's digital awakening, we caught up with the furry blue monster to see what he thinks about Twitter, his next duet, cookie drones, and Google's resistance to name Android after his favorite treat. ME HAPPY YOU HERE, JOHN. AND YOU KNOW, ME LIKE ENGADGET. YEAH, YOU MUST REALLY LIKE GADGETS. I do like gadgets. Speaking of gadgets, I have a cookie for you. COOKIE! YOU BROUGHT COOKIE FOR ME? OH ME LOVE YOU. ME GOING TO EAT IT RIGHT NOW. COWABUNGA! OMNOMNOMNOMNOMNOMNOMNOMNOMNOM. SO, INTERVIEW OVER? OK! No, that's just to get you ready. USUALLY THAT HAPPEN AT END OF INTERVIEW. ALRIGHT WE GET THAT OVER WITH SO WE JUST GET INTO IT. You've just joined Twitter a couple months ago. How's that going for you? Do you write your own tweets? OH YEAH. ME DO WRITE ME TWEETS. AND YOU KNOW WHAT? ME MET LOTS OF FELLOW TWITTUHERRERRERS. THAT HOW YOU SAY THAT? TWITTUHURRERS....TWITTEHUHRRRERRRRS. Yeah, but they never named it after a cookie. How do you feel about that? WELL, ME OF COURSE WOULD PREFER THAT THEY NAME IT AFTER COOKIE. So, what kind of cookie? OH! CHOCOLATE CHIPPY! WOULD THAT SOUND OK THOUGH...CHOCOLATE CHIPPY AS PROGRAM? IT DON'T SOUND TOO GOOD. BISCOTTI! THAT SOUND GOOD! ...Yeah, there's a lot of singers and musicians that come to Sesame Street. Any songs you haven't had a chance to do that you'd like to sing in your own Cookie way? OH BOY, YOU KNOW, UHM, YOU KNOW IT JUST SORT OF LIKE WE KIND OF SEE WHAT'S OUT THERE AND IF SOMETHING HIT US WE DO IT. Well, there is this popular (Grammy-award winning) hit by Sam Smith "Stay With Me..."
OH YEAH ME LIKE THAT SONG. SO THE COOKIE THEY STAY WITH ME THEY NO GO ANYWHERE. I WANT THEM TO "STAY WITH MEEEEEEE." ME LIKE IT. ME THINK ME CAN SING THAT. MAYBE ME CAN DO DUET WITH SAM SMITH. DO YOU KNOW HIM? I don't know him personally but I could see if I can make a call for you. REALLY? TERRIFIC. GET YOUR PHONE OUT. RIGHT NOW! YOU BROUGHT IT UP. WHY WAIT? YOU MIGHT BE BUSY LATER. YOU HAVE HIS NUMBER? YOU HAVE HIS EMAIL? I have his Twitter handle. OK THAT WORK...SAM, ME HOPE YOU READY. LOOK AT THOSE THUMBS GO. GOOD MAN, YOU A PROFESSIONAL! I would like to think so. Hit send...off it goes! DID HE ANSWER BACK YET? WHY NOT? Not yet, sometimes people have things to do. Be patient! Remember, "Me Want It, But Me Wait." YEAH YEAH YEAH YEAH ME LEARN STRATEGIES HOW TO WAIT. So, you're the creator of the hashtag on Twitter, #OMNOMNOM, it's all about how you eat cookies and how you eat food. ME NEVER REALIZE THAT ME ACTUALLY DO THAT. SOMEBODY TOLD ME ABOUT IT AND ME LIKE "DO ME REALLY DO THAT?" ME ATE A COOKIE, "OMNOMNOM," ME DO DO THAT! So, have you ever seen a drone flying around Sesame Street? "DO ME REALLY DO THAT?...ME DO DO THAT!" Yeah, but it's like a flying robot. With a camera on it, or it has little gifts it drops. ME NEVER SEEN IT ON SESAME STREET. Well, maybe it will come to Sesame Street soon, but what do you think of a "cookie drone?" ME LIKE IT. SIGN ME UP. HOW ME GET THESE DRONES? YOU GOT PEOPLE? GO AHEAD, GIVE THEM A CALL. PULL OUT YOUR PHONE. DID SAM ANSWER YET? Sam did not answer yet. OK WHAT ABOUT DRONE GUY? YOU GOT DRONE GUY? Ah, yes, I know someone who has drones...Let me tweet my drone friend. AND WE'RE GONNA GET COOKIE DELIVERY TO SESAME STREET, AH, MAYBE EVERY DAY FOR THE NEXT FIVE YEARS. We'll find out, no promises. TERRIFIC! WOW, JOHN, ME LOVING THIS. YOU ON CUTTING EDGE. YOU SO CONNECTED. ME LOVE THIS. I heard a new museum opened up on Sesame Street, but I heard you got into some trouble at the museum. Tell me about that. OH, IT CALLED THE "MUSEUM OF MODERN COOKIE." 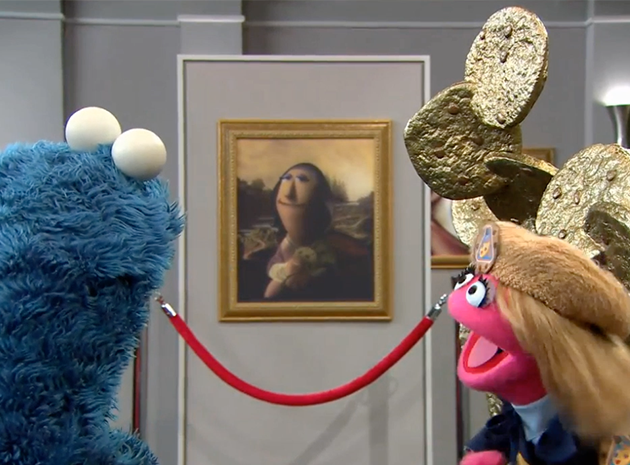 IT ME FAVORITE MUSEUM IT HAVE ALL OF THE IMPORTANT WORKS OF COOKIE ART. IT NOT ONLY LOOK GREAT, IT LOOK DELICIOUS! SO YOU KNOW, ME HAVE TO TRY TO CONTROL ME SELF AND NOT EAT THE ARTWORK. ESPECIALLY IMPORTANT WORKS LIKE THE "MUNCHA LISA" BY LEONARDO DA CRUNCHIE. THAT A REALLY PRETTY WORK OF ART. THEN THERE THE "CREAM" BY EDWARD MUNCH. Well, Cookie Monster, it has been an honor chatting with you! OH IT BEEN SO FUN, JOHN. YEAH! TERRIFIC. 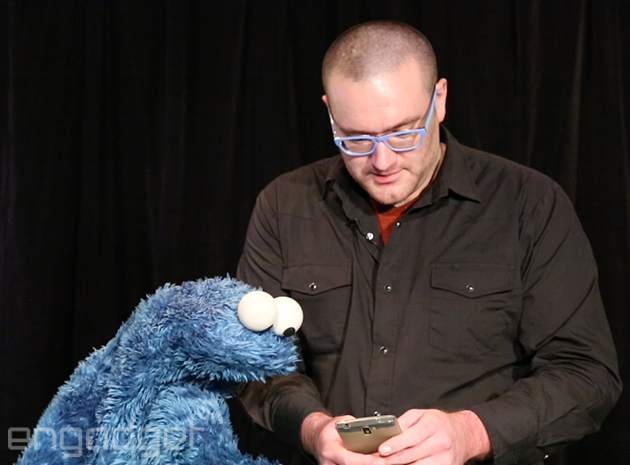 UPDATE: Every good interview with Cookie Monster comes with a blooper reel, right? Right. Find out what happens when Cookie tries on my glasses and learn more about what he stores in the "Me Cloud" in the clip below. Edgar Alvarez contributed to this report. This interview has been condensed and edited.